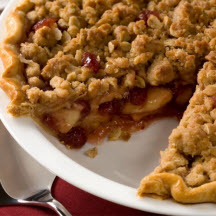 Your family will love this all-American dessert with apples, cranberries and a crumbly streusel topping. Combine flour, brown sugar, oats, and cinnamon. Gradually stir in butter until mixture is crumbly; set aside. Roll pie crust in a circle with an 11-inch diameter on lightly floured surface. Place the pie crust into a 9-inch pie plate and fold excess crust under at the edge of the pie plate. Press pie crust together along the rim to form a thick crust. Create a decorative edge by pressing down on the crust with fingers or tines of a fork, if desired. Combine apples, cranberry sauce, brown sugar and cornstarch until well blended. Spoon apple mixture into pie crust. Sprinkle with Streusel mixture. Bake about 1 hour, or until apples are tender. Serve warm.